Susan Rice and McCain: The Republican attack on the U.N. ambassador over Benghazi is ridiculous. McCain and his allies are only going to hurt themselves by ganging up against her. The Republican gang-up on Susan Rice is a puzzler. Not only does it make no policy sense to blame the U.N. ambassador for any aspect of the killings at Benghazi, Libya, it makes no political sense either. So far five GOP senators have objected to the idea of President Obama nominating Rice to be the next secretary of state. Two of those senators—John McCain and Lindsey Graham—are party leaders on foreign policy and frequent visitors to TV news studios. This is what makes the campaign particularly bizarre. Their case against her is not just unusually flimsy and transparently partisan; It also shines a glaring light on their own brazen hypocrisy (something most politicians do all they can to avoid). First, the facts. The weekend after terrorists attacked the U.S. Consulate in Benghazi, killing four officials including the ambassador to Libya, Susan Rice went on the talk shows to deliver the administration’s position. The official line at the time was that the attack began as a spontaneous protest—similar to the one that sparked violent demonstrations outside U.S. embassies in Egypt and elsewhere—to an American-made anti-Muslim movie that had gone viral on the Internet. 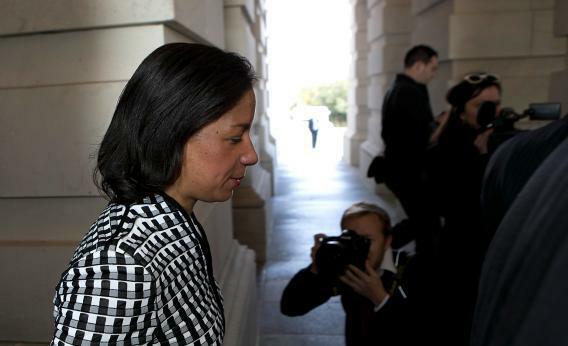 As it turned out, and as she explained in a meeting with senators on Tuesday, Rice was only reciting an unclassified “talking points” sheet prepared by the U.S. intelligence community. Acting CIA Director Michael Morell, who joined Rice at the meeting, affirmed that those talking points were consistent with classified intelligence reports at the time. * He also noted that, to the extent that Rice’s authorized comments differed from the top-secret version (for instance, they left out the finding that a jihadist group was involved in the attack), it was for security reasons. Was this an intelligence foul-up, worthy of a congressional hearing or two? Possibly. Was there a scandalous cover-up? Doubtful. Whatever an investigation turns up, is all this a valid excuse for denying higher office to the ambassador who went on TV and recited the intelligence community’s talking points? Of course not. More than that, the five senators must know it’s absurd, so trumped-up are their rationales for thinking otherwise. We knew in hours of all the details when we got bin Laden, they’re making a movie out of it, and [yet] here we are, ten weeks later [i.e., after the Benghazi attack] finally our ambassador to the United Nations, who appeared on every national Sunday show, is now saying that she gave false information concerning how this tragedy happened. I don’t know if this is, as Talking Points Memo Editor Josh Marshall put it, the “stupidest thing McCain ever said,” but it’s probably one of the three or four most desperate. First, we knew everything about the raid on Bin Laden’s compound so quickly because (this should be really obvious, senator) the commandos who did it, our own Navy SEALs, were there. They streamed it live. By contrast, the details of a firefight at a remote outpost in Libya are more likely than not to be shrouded in confusion and ambiguity, for a while. Second, giving “false information,” which is legal parlance for “lying,” is an over-the-top characterization of what Rice did. Third (and this really should shut the door on the whole business), when McCain picked Sarah Palin as his running mate in the 2008 presidential election, he forever disqualified himself from commenting on any nominee for any high office—and the media should treat any such comments accordingly. Sen. Graham has made many foolish remarks in this sorry saga as well, but the jaw-dropper is his comparison, also made after Tuesday’s meeting, between Rice and John Bolton, who was President George W. Bush’s controversial (and ultimately rejected) nominee for U.N. ambassador. As Graham summarized the Bolton fight, “Democrats dug in their heels and said, ‘We’re not going to vote, we’re not going to consider this nomination until we get basic answers to our concerns.’ ” His point, presumably, was that he plans to do the same if Obama nominates Rice for secretary of state. There are several differences between Bolton and Rice. For instance, Bolton had made highly critical statements about the legitimacy of the United Nations—and even of international law. Many Democrats and a few Republicans thought these were inappropriate sentiments for a U.N. ambassador. The Democrats held up Bolton’s nomination, pending the release of documents concerning precisely those sentiments—not some peripheral matter over which the nominee had no say or control. Sen. Kelly Ayotte (R-N.H.)—who seems to be auditioning for the “third amigo” now that Sen. Joseph Lieberman (I-Conn.) is retiring, leaving McCain and Graham bereft of a traveling companion—says she will try to block the confirmation of any nominee for secretary of state. “My view is we should hold on this until we get sufficient information” on Benghazi, she said. Well, at least she’s honest about her motives. The other side players are oddballs. Sen. Bob Corker (R-Tenn.) accused Rice of excessive loyalty to President Obama. “While I think she’d be outstanding as head of the Democratic National Committee,” Corker told reporters, “I’ve just never seen that sense of independence from her.” This is both dubious and irrelevant. Rice is hardly a political hack; she held posts in President Clinton’s State Department and National Security Council, and at think tanks and global management firms while Republicans were in the White House. While she is loyal to the president (she was one of his earliest foreign-policy advisers), that’s never been a disqualifying trait for a cabinet job. Colin Powell may have been the most independent secretary of state in recent times, but that made him less useful as his views strayed further and further from those of George W. Bush. The European allies found Powell more to their liking, but they could never tell whether he was speaking for himself or for the president. Odder still is Sen. Susan Collins (R-Maine), who said on Wednesday, “I continue to be troubled by the fact that the U.N. ambassador decided to play what was essentially a political role at the height of the contentious presidential election campaign by agreeing to go on the Sunday shows to present the administration’s position.” Imagine that! A senior administration official presenting her administration’s position! “What troubles me so much,” Collins went on, “is that the Benghazi attack in many ways echoes the attacks on [two U.S. embassies in Africa] in 1998 when Susan Rice was head of the African region for our State Department.” Collins is vying for Josh Marshall’s most-stupid award with this one. I don’t recall anyone blaming Rice for those attacks at the time, nor anyone blaming, say, the assistant secretary of state for Middle East affairs when terrorists blew up the U.S. Marine base in Lebanon in 1983. This is where sheer hypocrisy enters the picture. In 2005, when President Bush nominated Condoleezza Rice as secretary of state, many Democrats hammered her for making misleading remarks about Saddam Hussein’s supposed possession of weapons of mass destruction in the run-up to the invasion of Iraq. Bear in mind that Rice had been Bush’s national security adviser, front and center during the WMD hype, not a peripheral figure like U.N. ambassador. Yet who stood up for that Rice most fervently in the Senate? Lindsey Graham and John McCain.